Science and medicine have revolutionized the process of “making a baby,” but with new technologies come new ethical concerns. While some Christians are embracing “contraception,” IVF, even cloning technology, others warn that we are treading on unsafe ground. 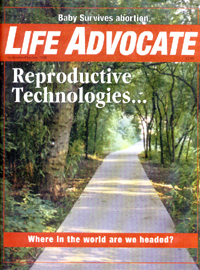 This month Life Advocate looks at the 5th annual bioethics conference at Trinity International University.